If the Copa America Centenario does nothing else for the rest of the tournament, it’ll be remembered as the tournament that Fernando Fiore graced American English television with his presence. That may not necessarily be great news to all fans but Fiore has certainly made things entertaining in the Fox studio with his light hearted and informational analysis. In case you have been unaware of Fernando Fiore, Fiore has been a fixture on Spanish broadcasting since the 80’s, hosting Univision’s World Cup coverage. Now, Fiore has been a part of Fox’s Bundesliga Spanish coverage on Fox Deportes and has come over for Copa America coverage on English language Fox networks this month. Fiore also hosts Fox’s Copa America post game wrap up show Copa Tonight. 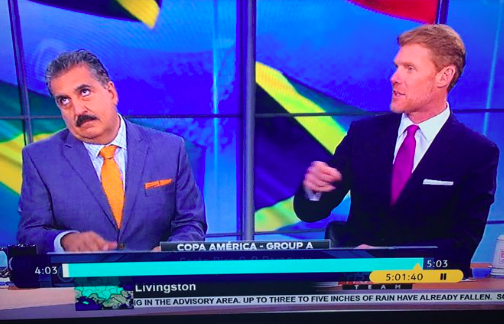 For Fox’s Copa America coverage, Fiore broke onto the scene almost immediately in the first night of the tournament. During halftime of the United States/Colombia game, Fiore and Alexi Lalas discussed DeAndre Yedlin’s handball that led to a penalty and a Colombia goal. Lalas agreed with the call while Fiore disagreed, which led to these interesting exchanges. For the record, I sided with Lalas but I couldn’t help but at least consider switching my opinion to Fiore just simply based on how entertaining he made his argument. Fiore and Lalas are polar opposites and each seem to make the other better. I feel like they could make for a great buddy cop movie. When it comes to Fernando Fiore’s style, it’s easy to say that Fiore is passionate about his work. But that would make it sound like everyone else in the Fox studio isn’t passionate and I’m sure they are, otherwise they would be rather terrible at their job. The difference with Fiore is that he is able to be rather outlandish and at the same time be informational and genuine about his analysis since it fits his personality. Let’s face it, what works for Fernando Fiore may not necessarily work for Herculez Gomez, who has also been a great addition to the Fox staff. I think if Gomez started dancing around like Fiore had over Yedlin’s handball, it would seem over the top and cringeworthy. For Fiore, it’s perfect. I know Fernando Fiore isn’t going to be everybody’s cup of tea and that’s okay. But if I’m able to laugh right after seeing the USMNT lose 2-0 to Colombia last Friday, that has to account for something. So here’s a note to Fox, the more Fernando Fiore, the better.